The Journal is pleased to announce that Whitney Swan, 16, is working with the newspaper as an intern this summer. Swan is a rising junior at Marion County High School. She is considering studying mass media after high school and wanted to get more experience and improve her skills. She found that she really enjoyed taking photos while in a high school media class taught by Michael Medders. That let to her helping form a small group, led by teacher Laurene Owens, called the R.E.D. News Team. The group reported on various things happening at MCMHS. 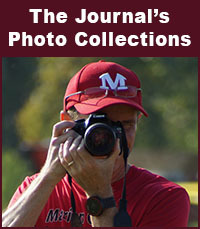 Many of those stories were published in The Journal during the last school year. Due to her enthusiasm and openness to talk to people she didn't know, she became the team's "go to" person for interviews. She interviewed many teachers and students, as well as visitors to the school (including Congressman Sanford Bishop). "I love doing face-to-face interviews," she said. "I like being with people and finding out new things." She added that she quickly learned that it wasn't as simple as just sitting down and talking to people. "I think the biggest thing I learned was that I needed to have some knowledge about what they do before I interviewed them," said Swan. "I needed to do some research to prepare for the interviews." The most challenging assignments were when she was called upon to write about speakers that she didn't personally get the opportunity to hear, so she really had to research and ask other students what they learned and what they thought about the speakers. Whitney Swan is the daughter of Henry (Phillip) Swan and Winda Swan. She was last year's Principal's Award winner for the sophomore class at MCMHS.